SAINT LAURENT BY ANTHONY VACCARELLO jacket, shirt, jean, belt and boots, DSQUARED2 tie, TOM FORD sunglasses, and CHROME HEARTS ring. SAINT LAURENT BY ANTHONY VACCARELLO jacket, shirt, jean, and belt, DSQUARED2 tie, TOM FORD sunglasses, and CHROME HEARTS ring. The truth is that Lenny Kravitz almost didn’t come out of the jungle. He was alone there for six months, his company primarily consisting of wild monkeys and parrots. In the afternoons Lenny Kravitz would ride a horse into the fields, which sounds like an image you’d see in an advertisement for artisanal tequila but which is something Lenny Kravitz actually did during this episode of his life, when he was off the grid and existing in-sync with the rhythms of nature on his farm in the remote mountains of Brazil. Kravitz did not want to leave his agrarian enclave. But to own a farm in the remote mountains of Brazil, one must be either a Brazilian farmer or a rockstar, and Lenny Kravitz, falling into the latter category, couldn’t just disappear into the jungle on horseback. He was instead, in time, coaxed off the farm by his management team. BALMAIN jacket, SAINT LAURENT BY ANTHONY VACCARELLO jeans, and DIOR HOMME sunglasses. 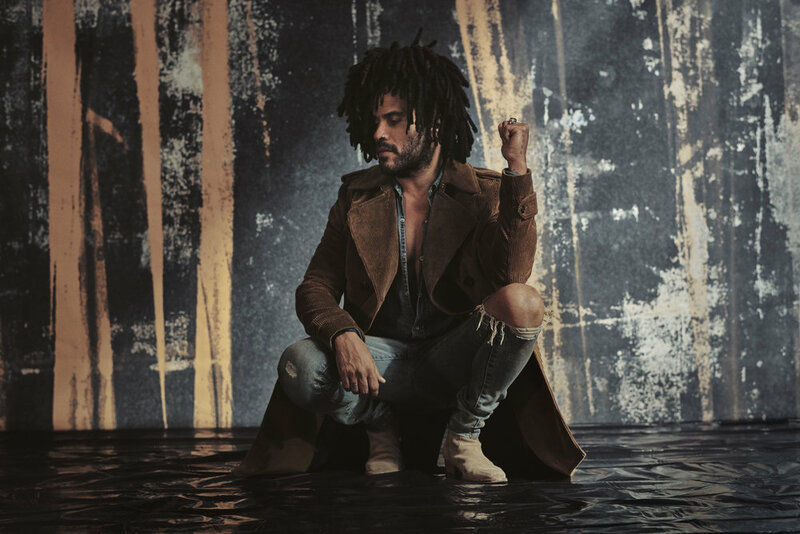 The point in Kravitz telling you this story is for him to say that a heavy dose of nature always connects him with his sense of spirit, that the middle of nowhere feels holy to him. The point in me telling you this story is to affirm that yes, Kravitz is as cool and heady as you always suspected he might be. With accessories including a remote South American farm, his life is also nothing like yours or mine, because he is an actual rockstar, a creature as magnificent and rare as those kaleidoscopic Brazilian parrots. Take, for example, where we’re currently sitting, Kravitz and I—on a patio on a bluff overlooking the Pacific. The sun glitters on the water and waves crash on the beach below, soundtracking an otherwise still Thursday afternoon in Malibu. Kravitz is staying here while he’s in town, in the guesthouse of this lush estate, which belongs to a friend who’s never named and who never materializes, but, with a house with this view, is surely a good friend to have. Kravitz is wearing black pants, no shoes. The buttons of his black velvet shirt are undone on the bottom and top, revealing a tattoo on his left pectoral. His dreads form a mop on his head, and he’s without sunglasses. He sports two nose rings—a stud and a hoop—one in each nostril. Altogether it’s a rocker-shaman look few people could pull off. Kravitz is pulling it off. We’re here to discuss his new album, Raise Vibration, which is a very shaman-rock album title. The dozen songs on the LP came to Kravitz in his dreams, a not uncommon creative process for the 54-year-old musician, who sparked his career three decades ago with 1989’s psych-rock funk warrior call to arms, Let Love Rule. Kravitz dreamt some of that first album too, hearing a chorus or verse or melody or an entire song in his sleep and then rising to capture it on a recorder kept on his nightstand. You’ve gotta get up and do this no matter how comfortable you are in bed, he says, otherwise the music gets away. It was while making Let Love Rule that these dreams, and in fact his entire well of sonic inspiration, dried up. No new music. Nothing. Then in his mid-20s, he thought his gift—roused to life during adolescence by idols like Zeppelin, The Stones, Prince, and Coltrane—might be gone forever. In time though, he realized he’d just been working too much, too intensely; that he needed a break. This was before the farm era, but he did find some time to recalibrate. When his creative flow returned, he wrote a song about the experience—“Be” from Let Love Rule— and called it a lesson in patience and faith. The experience has guided him since. And the songs always came, from 1991’s “It Ain’t Over ’Til It’s Over” to 93’s “Are You Gonna Go My Way” to 98’s “Fly Away” to the other mega-hits and deep cuts populating his 11 studio albums. Out on September 7 via Roxie Records/BMG, Raise Vibration is the first LP that came to Kravitz entirely in dreams. He didn’t sleep much while channeling the music, rising a few times a night, between two and five in the morning, for months. AMIRI jacket and jeans and DIOR HOMME sunglasses. 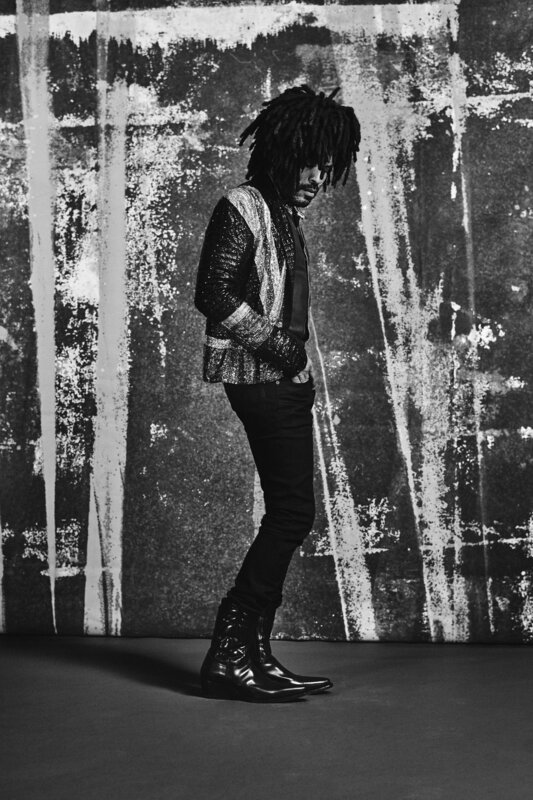 One thing that becomes clear when talking to Kravitz is that his life is defined by lofty ideas and lived experiences of faith, inspiration, and creativity. That sage quality Kravitz has always seemed to possess—it seems real. In the liner notes of Raise Vibration, he writes that his message always was and will be about love, a concept Kravitz makes tangible in daily life by staying in gratitude, thanking god for waking up each morning. He says just living is his meditation, which is a statement one might roll their eyes at if it were coming from anyone but Kravitz, but which when coming from him feels reasonable. SAINT LAURENT BY ANTHONY VACCARELLO jacket, TOM FORD sunglasses, and talent’s own jewelry. What are the major lessons you’ve picked up in your lifetime? LK: That you can never be too kind, too patient, too loving. You just can’t. But let’s take it back down to earth and discuss the ways Kravitz is also a real person: he makes direct eye contact when he speaks and checks to make sure my recorder is working properly. He keeps his cell phone out of sight, compliments my necklace, and lets me use his bathroom. He dotes on his daughter Zoë, calling the 29-year-old actress (with ex-wife Lisa Bonet) his proudest accomplishment. When it gets too hot in the sun he relocates us into his guesthouse, which is cool and dim and scattered with rockstar accoutrements: a pair of black cowboy boots, a Louis Vuitton toiletry trunk with a cracked mirror, well-worn slippers. He’s gracious and normal, but also not normal at all, because he’s Lenny Kravitz. What do people get wrong about him? I ask Craig Ross, Kravitz’s guitarist. Craig Ross: He’s got an incredible sense of humor. I don’t know if that always comes across. He’s a genuine artist and is completely true to what he does. He should be respected as one of the great musical artists, I think. BALMAIN jacket, TOM FORD shirt, SAINT LAURENT BY ANTHONY VACCARELLO jeans, and DSQUARED2 boots. When you think about it, Lenny Kravitz has pleased more people than most, with millions of albums sold, four Grammys awards, and countless tours in the books. It can be a lot when the whole world wants to take a selfie with you. In fact, Lenny Kravitz would rather give you a hug, share a moment, but he always takes the photo. I’m curious about people in your sort of very particular position, where you’re putting art out into the world, and have a lot of energy coming towards you. LK: You’re giving all the time. Whether you’re performing, dealing with people, dealing with people in your face, you’re giving, and you get to a point where you get numb. I just did five months of touring. I did months of press before that. I made the album before that and just recently, I hit a wall. I realized, ‘I’m not feeling myself.’ That’s the best way to describe it, a sort of numbness. In a few weeks Lenny Kravitz will self-prescribe his remedy of choice: escape to his place in the Bahamas, where his grandfather was born and where he’s been visiting since infancy. Stop wearing shoes. Make the most difficult decision of the day be about what to eat for dinner. Laugh with the locals when an errant fan comes looking for you. Swim. Sleep. Walk. Repeat. Emerge refreshed. Go on tour, melt people’s faces off, call your guitarist at 8am and have him meet you at the studio to work on the song you dreamt up last night. SAINT LAURENT BY ANTHONY VACCARELLO coat, shirt, jeans, and boots and CHROME HEARTS ring. Tell me a story about Lenny Kravitz. Craig Ross: I was in the Bahamas doing a record, and he was in Los Angeles. My 50th birthday was coming up, and he calls me and says, “We have to do this little show, just you and me. Sorry it’s going to be on your birthday, but I’m going to have to fly you here, and you’re going to have to work.” So I meet him and he takes me up to this house where he’s staying, to rehearse. We’re going to get to work, and he says, “Let me show you the house,” and he opens the door to the kitchen and everybody I know, from all over the world, is in that room. He’d been working on it for months. It was the most incredible thing anybody has ever done. That’s the kind of guy he is. It’s hard to pinpoint Lenny Kravitz’s contemporaries. Spotify’s “related artists” area will point you to acts as disparate as Mick Jagger and Jamiroquai, demonstrating that there aren’t actually many people like Lenny Kravitz. He plays soul, funk, rock, pop, free-form jazz. He’s got a co- writing credit on Madonna’s “Justify My Love” and can drop a sentence like, “Early on, Curtis Mayfield really encouraged me to do my thing.” He’s cameo’d during Katy Perry’s 2015 Super Bowl halftime show performance, worked with Prince, Bowie, Dylan, and Aretha Franklin, and played himself in a 2002 episode of The Simpsons in which Homer goes to a rock and roll fantasy camp and gets style tips in “Lenny Kravitz’s Thread Shed.” He’s a guy who when asked about the best career advice he’s gotten, shares with me a story he also once told to Oprah, about when Robert Plant was opening for him on the Are You Gonna Go My Way tour. SAINT LAURENT BY ANTHONY VACCARELLO shirt, pants, and necklace, and CHROME HEARTS ring. In 2012, Kravitz repaid the favor by ripping through “Whole Lotta Love” during Led Zeppelin’s induction into the Kennedy Center Honors. The audience included the band’s three living members, David Letterman, and Michelle and Barack Obama, the latter of whom nodded in blissed out appreciation as Lenny Kravitz hit the high notes. After the performance, Plant gave him the thumbs up from the balcony. In fact, Lenny Kravitz exists in the velvet-lined middle ground of a rock and roll Venn diagram connecting the classic and contemporary, pop music and experimental art. He’s a bridge, the guy chosen to interpret rock classics for America’s most modern president. Given the music industry’s continued fracturing into siloed genres and distribution modes, it’s reasonable to believe there won’t be many more rockstars like him, that there simply can’t be, that Lenny Kravitz is one of the youngest members of the old guard of legends. He doesn’t even listen to new music, returning instead to A Love Supreme when picking something out for the turntable. SAINT LAURENT BY ANTHONY VACCARELLO shirt and necklace and DIOR HOMME sunglasses. On the horizon for him is a European tour and production for a movie he’s written (and has already completed the soundtrack for). He’s not sure whether he’ll direct and won’t divulge what it’s about, but says acting is a slick way for him to collaborate with other artists and not have it be just about him. His performances in Precious and The Hunger Games series, in which he also played a stylist, demonstrated his agility with the format. He also has his longstanding design business and is the first creative director for Dom Pérignon, which is a very rockstar thing to be. But despite the glitz, he says this phase of his life is about being of service, giving back, deepening his purpose. There’s no reason not to believe him. Do you consider your legacy? LK: I feel like I’m just getting started, honestly... I really haven’t done much yet, as far as I’m concerned.